It's officially that time of year... when every food blogger on the internet busts out all the pumpkin, cranberry, apple, (insert fall food of your choice) recipe he/she has been hiding from you all year long. 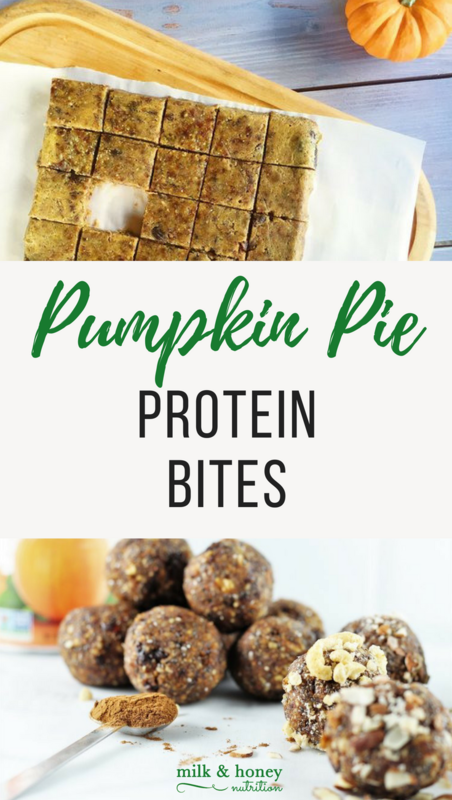 So, it shouldn't surprise you that I decided to give my Pumpkin Pie Protein Bites a little makeover this week. I'll be making these on repeat for the next few months and I know once you make them yourself, you'll want to do the same. I love them! I mean, who doesn't love pumpkin cereal?! My kids love them! (See picture, ha) And quite honestly, that trumps number 1 most of the time. So, go ahead... make them. And then come back here and let me know what you thought in the comments. This recipe was sponsored by Sprouts Farmer's Market. All thoughts, opinions, and recipe ideas are my own. Combine the first 9 ingredients (through the protein powder) in the food processor and pulse until they form a powder (about 20 seconds). Add in the remaining ingredients until it starts to ball up (about 1-2 minutes). You may need to scrape down the sides once or twice, and resume processing. Press batter/dough into a plastic wrap lined square pan, then place another piece of plastic wrap on top and press flat. Refrigerate for at least 2 hours. If you pressed the batter/dough flat, remove the plastic wrap pieces, and cut into desired shape. Enjoy! *Use code: MILKANDHONEY for 15% off at The Natural Citizen!